It’s an odd day when there’s not a mushroom to be found in my kitchen. We go through them like they’re going out of style, and my ears always perk up when I come across recipes calling for any sort of fungi. Mushrooms are just so versatile, and have a wonderful flavor, no matter if you grill, stuff or sautée them. I find myself using them more as a substitute for meat -- grilled portobello caps make great burgers, and I like my fajitas with sliced creminis as much as I do chicken or steak. I came up with this super-simple, meat-free dinner the other night in an attempt to use up the rest of my Thanksgiving-stuffing herbs. Sure enough, I also had a pound of white mushrooms in the fridge. 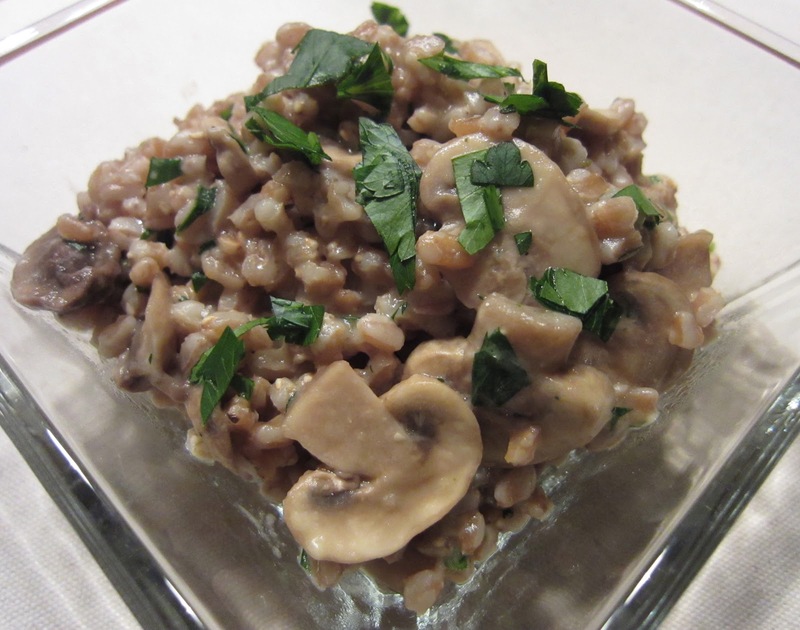 Combine farro and water in a medium saucepan. Bring to a boil over high heat and then reduce to low heat, cover, and simmer for 20-30 minutes, until farro is tender. Drain farro and set aside. Melt butter in a large frying pan over medium heat. Add mushrooms and thyme and sautée, stirring occasionally, for 4 or 5 minutes. Add broth to pan with mushrooms and simmer for a few minutes. Lower heat and add cooked farro to pan, stirring to mix. Stir in the parsley and Parmesan, season with salt and pepper, and serve.